The needs of mobile users for mobile printing have increasing sharply from 16% in 2011 to 49% in 2015. This means that currently, almost half of all mobile users want access to mobile printing. The paradigm of the printing market is shifting. The compound annual growth rate (CAGR) based on volume of pages of non-mobile printing is forecasted to increase by only 2.2 %. However, the CAGR by volume of pages of mobile printing is estimated to increase by 20 % in the same period (2008-2016). Though the use of mobile printing is expected to grow, the largest barrier for its popularization is the misconception that it is too difficult to adopt. Recently, Samsung started equipping almost every printing product with mobile printing functions like NFC tagging, mobile printing applications, cloud printing and more for making mobile printing easily accessible for all mobile users. Now, Samsung Mobile Print compatible product series are even more than 170. Also, Samsung’s Cloud Print compatible series are more than 90 and will boost the number of its series more than 110 by next month. Samsung applied mobile printing function in 2010 for the first time. Now, Samsung’s fourth generation mobile printing solution is providing the easiest and most convenient way to print from smart devices. Samsung Mobile Print features instant mobile printing directly from mobile to printer for printing photos or documents saved on mobile devices without a PC. It doesn’t require data usage and is able to connect through Wi-Fi and Wi-Fi Direct, even when accessing the cloud. Samsung Mobile Print also provides powerful image editing functions like on a PC. It includes 14 features for instant enhancement, color adjustment, effects and other modifications, such as cropping and rotation. No other mobile printing solution offers such a wide-range of editing functions. 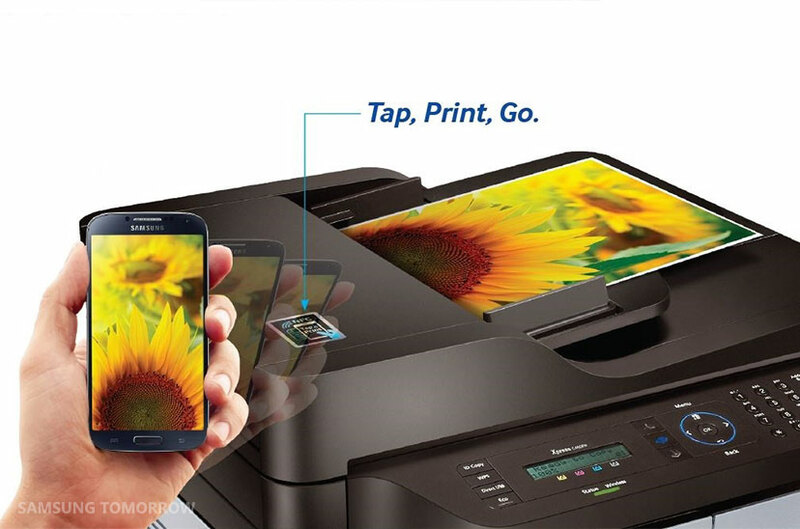 Single-tap pairing between users’ smart devices and printers, offered through NFC tagging, Wi-Fi Direct, Wi-Fi and USB connection makes Samsung Mobile Print the easiest to use. And its mobile printing app for customizing preferences and keeping menus neat and clutter-free includes cloud services and access to social networking sites. For small office and home office (SOHO) businesses, Samsung introduced Cloud Print Public last May. Samsung Cloud Print Public is a perfect solution because it offers a high-quality print experience from mobile devices. It supports each file up to 16 MB, utilizing unique rendering software based on the cloud to convert files into print-ready documents without any loss of quality, which is superior to other mobile printing solutions. Cloud printing technology enables simple device-to-printer connection without a PC for a hassle-free experience. With no need for a Wi-Fi connection or print drive, users can print quickly and effortlessly from any location, regardless of network. It only takes four simple steps to install the cloud printing app and pair your device with a printer, even without a local network connection. The sign-up process can be completed with a phone number, without creating a new account. Scanned files can be sent to users’ mobile applications or cloud storage. Cloud preview enables users to remove unnecessary pages. Both of these features, along with secure pairing with NFC tag-and-go technology are available only through Samsung. During the second half of this year, Samsung will launch additional cloud printing solutions with enhanced security features for small to medium businesses (SMB). It will also improve overall mobile printing solutions to give seamless business experiences on any devices, anytime, anywhere.